I am struggling with the culture in my current organization. The goals set by management are ambiguous and seemingly meaningless. Performance feedback and “constructive criticism” are at first rare, then harsh and punitive. Morale is horrible. I dread going to work every morning! Everyone does. What can my colleagues and I do to make a positive impact on the culture of our organization? If misery loves company, then take solace in knowing that there are a lot of people out there who suffer similar circumstances. Job satisfaction, pride, meaning, happiness (maybe even joy), are not terms that many people associate with their jobs. Depending on the survey you read, as many as two-thirds of employees polled across the country don’t like their work. I once interviewed a group of front-line supervisors who so hated their jobs that they looked into the mirror each morning and talked themselves into going to work that day. Not good. When it comes to how most of us feel about our jobs, we fall somewhere between “thrilled to go to work” and “bring me a mirror.” The fact that you’ve spotted a problem with morale in your current job and that you’re anxious to do something to improve it is good news for the people around you. It is an important issue, it can be addressed, and it’s definitely worth the effort. So, let’s start with a couple of key ideas. First, it doesn’t take much to turn a career into a job and a job into a daily grind. Lots of elements have to be in place to create both a job and workplace that generates daily satisfaction. One element goes wrong, and a job, even an entire workplace, can go sour. Second, there are lots of positive emotions that could and should be associated with work. Most people shoot for being satisfied, and that’s nice, but many people actually take genuine pleasure from their work. For others there’s pride; for still others, meaningfulness. Many find deep and abiding relationships. Some describe their work place as happy and, as we’ll learn later from our friend Rich Sheridan, some even aspire to making the workplace joyful. Imagine that—”joy” and “work” being used in the same sentence. It’s important that we acknowledge the fact that a workplace can be a cornucopia of positive emotions. It gives us something to aspire to. Stress shouldn’t be the norm. Anger, depression, boredom, disgust, fear, and other negative emotions shouldn’t be shrugged off with, “Hey, it’s work. Nobody said it was supposed to be fun.” Work is too time consuming and life absorbing not to provide us with lots of positive emotions. Anything less would be a tragedy. So, let’s look at some likely places to start exploring and intervening, if you want to create a productive and satisfying workplace. Candor. When we first started studying people at work, we quickly discovered that every workplace came with a potential malaise. Often, people don’t feel comfortable expressing their best ideas. They quickly learn that if they openly disagree with the current thesis (particularly if their opinion runs against the majority or a person in authority), they fall under attack. Sometimes it’s only an ugly stare, but it’s an attack nevertheless. So employees learn to shut up to keep the peace and then suffer the consequences of working in a place where poor ideas are routinely accepted. If people can’t voice their opinions, speak up to solve problems, and bring their best ideas into play, they’re not going to like their jobs. Accountability. If you want to be happy at work, don’t take a job at a place where accountability is spotty. You’ve seen it. Coworkers don’t stick to their promises and let you down, and then nothing happens. This can be very frustrating. You end up doing the work of two because others aren’t doing their fair share and are getting away with it. In a similar vein, allowing people to bully coworkers, disregard safety, deliver poor quality, and otherwise underperform can lead to enormous stress. And if the bosses finally get upset at the current level of performance and then go off on a tirade, you have a whole new set of problems. If your accountability system and the face-to-face skills that go with it are subpar, don’t expect job satisfaction. Influence. Today’s marketplace is so turbulent that organizations are constantly being forced to reinvent themselves. This means that if leaders aren’t adept at both motivating and enabling changes in routine behavior, they’re going to create two competing camps—one fighting for the new, the other clinging to the old. If you can’t create a vision of the kind of organization you want to become, along with a path to get there, expect conflict, disappointment, and angst. Now, I realize that I’ve just addressed three areas we write about. There’s a reason for this. We believe they form the very foundation of organizational success along with the attendant positive emotions. Nevertheless, there are other factors to consider as well—each with it’s own gurus and theories to back them up. Let me quickly share four. Flow. After years of analyzing what leads to a deep sense of satisfaction with completing one’s daily assignments, Mihály Csikszentmihályi explains that if a job isn’t intrinsically rewarding, under one’s own control, and completed within an environment free of constant interruptions—it won’t be satisfying. Look for each of these three components in every job. Happiness. When Daniel Gilbert released his book Stumbling on Happiness, he forced us to rethink our views on what will bring us satisfaction. What we imagine will bring us satisfaction is often wrong. Gilbert recommends that we look to what actually brings others satisfaction, not what one imagines will do so. At the corporate level, take care to study what the best companies have aspired to and carefully consider those goals. Meaning. In a recent article published by Stanford’s Graduate School of Business, Dr. Jennifer Aaker suggests that happiness isn’t the only emotion to consider when evaluating one’s life (or, for that matter, running a company). Many people may not be happy in the moment, but they’re having a meaningful experience and that’s a good thing. The opposite can also be true. You can get something you want—which will make you happy—but satisfying your current wants is not likely to feel meaningful. In a similar vein, solving problems or working through tough relationships may not make one happy, but it can be very meaningful. As you generate your aspirations, consider a range of positive outcomes. Satisfaction and happiness are worthy aspirations, but don’t forget to include meaning on your wish list. Joy. 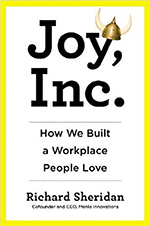 In his recent release of Joy, Inc., Rich Sheridan dares to take on the challenge of making the workplace not merely satisfying, but joyful. After years of working in settings that should have been satisfying, fulfilling, and even exhilarating but were actually stressful and depressing, Rich set out on a mission to find what it takes to create joy at work. It turns out, it requires a host of elements—many tied to the physical environment as well as how work is actually completed. If you want to see how one determined leader turned a stressful workplace into one that is both joyful and triumphant, check out Joy, Inc. So there you have it. It is a good idea to try to improve morale with all of its attendant emotions. Start with where people currently feel the most pain. Look under the hood and closely evaluate candor, accountability, and influence. Talk to your coworkers about the issue. Decide what you want to achieve and then measure those aspirations frequently and carefully. Dare you ask if people can’t wait to come to work each day? Would you ever poll employees by asking if they think about their job during their commute, or brag to their friends about the cool place they work? Set your goals high. Aspire to create a workplace where people routinely experience deep satisfaction, happiness, pride, meaning—and yes, even joy. Thank you Kerry, your comments to Desperate for Change were very appropriate for me. We must be co-workers. Our culture is similar to what they were describing. I love my work but not the work place. Everyone is very cautious because of the culture. I think that it is OK to have fun in the workplace, but there is such a fear that no one can enjoy and be happy. THere is plenty of meaningfull work but the fear is so intense it can’t be enjoyed. I am going to try to apply the principles that you have described and see if i can get buy in from others. It’s certainly worth the effort. Everyone should routinely ask if they’re getting what they want from their work. My partners and I had just such a conversation yesterday. We’re not always successful in getting everything we want, but stopping and talking about what is and isn’t working provides a good starting place.